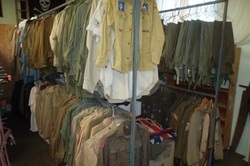 Southern Cross Militaria has hundreds of original uniform items for sale. Unfortunately, due to a lack of display space, the majority of our uniforms are in storage. If there is something special you would like to see and are coming to the store, please let us know and we can have it ready for viewing. On this webpage is just a small selection of what we have available. Email us from our "Contact Us" page if there is something you require but don't see here. Wholesale enquiries welcome. Feel free to call Darren on 07 4638 5565 during business hours. This is great collection of original and replica components which form an impressive display. I am not sure about the Helmet. It has probably been refurbished with painting, liner and chinstrap. The wire netting has been expertly fitted. It has a fresh German name written inside. The shell has no stampings, but is strong, unlike the normal reproduction. I welcome an inspection of this collection by any interested collectors to satisfy yourself as to the originality of each component. Australian Army Camo Shirts & Trousers. ​New condition $35 per item. Long and short sleeve available. ​Various sizes from 38", 40" and 42"
Badges vary from shirt to shirt, Photo for reference only. ​Bright buttons, named, original Ribbon bar. Trousers - Size 36" M. Leiboff & Son Bris. USN on the right. MAC printed on the left. Royal Australian Army Medical Corps. Trousers dated 1965 Approx 38"
No markings or size visible. ​WWII, Korean ribbon bars. Likely issued to the MAJ H E Gouey. ​Issued to 3794566 CPL C R Murfy. Some buttons missing. Includes belt. ​Excellent condition. All buttons, badges and belt. ​Excellent condition. All buttons and belt. ​Faint named to, CPL Williamson 2281216 ?. Missing some buttons. Staining and moth damage to front and rear. Marked D^D Great Coats G.S. 1946 Patt. Size 3. Height 5ft 5in-6in, Chest 36in-38in (over Jacket) R.LAPIDOS, QLD. 1951. 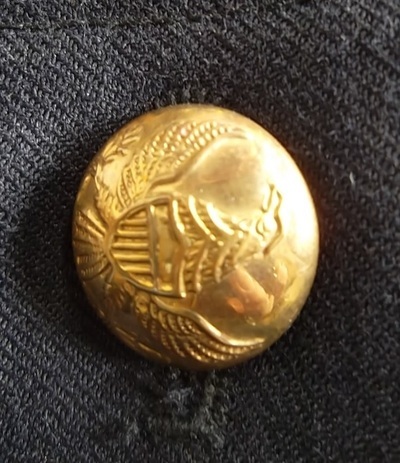 ​Incredibly rare Original WWII V-Neck pull-Over in very good condition. ​You will probably never see another one of these for sale. Made in Australia. All buckles and buttons intact. ​Retains original label. All buckles and buttons intact. ​RAAF issue, no belt loops. Missing 3 buttons. Retains original label. All buckles and buttons intact. Two hip pockets, 1 large and 1 small on rear. No Badges. Includes all buttons. Still retains original cardboard label inside. Excellent condition. Sole leather is as new. Includes a new pair of brown leather laces. Other sizes available. various conditions. Yakka Pty Ltd 1967 Victoria ​D^D marked. Very good condition with just one lower button missing. ​Accurate reproductions of the WWII AWAS dress. Approximate size 10. Some include buttons, others do not. Most come with epaulettes and belt. ​This is a "one only" item. Long sleeved and named inside. She belonged to the 2/4 AGH during her service. No buttons but in good worn condition. Great display item and super rare. ​This original AWAS dress is in great condition except for some mouse damage at the bottom as seen in the photo. We can send closer photos of the damage. ​Includes original buttons and Red Cross patch. Named inside but hard to read. Good condition throughout. ​We have a huge range of 37 pattern webbing, in individual pieces and in a range of kits. This complete Marching Order includes, belt, basic pouches, water bottle in carrier, side pack, back pack, ET cover, helmet and blanket. Please phone for more info on the large range we have. We can supply all the pattern 37 webbing items. Call us for a price on what you require. ​This is just a small selection of the helmets we have in stock. ​Please ring for further info. ​Here's a small selection of some of the original WWII Brown Boots we have in stock at the moment! From size 6 to 8.5 only. Please ring for further info. 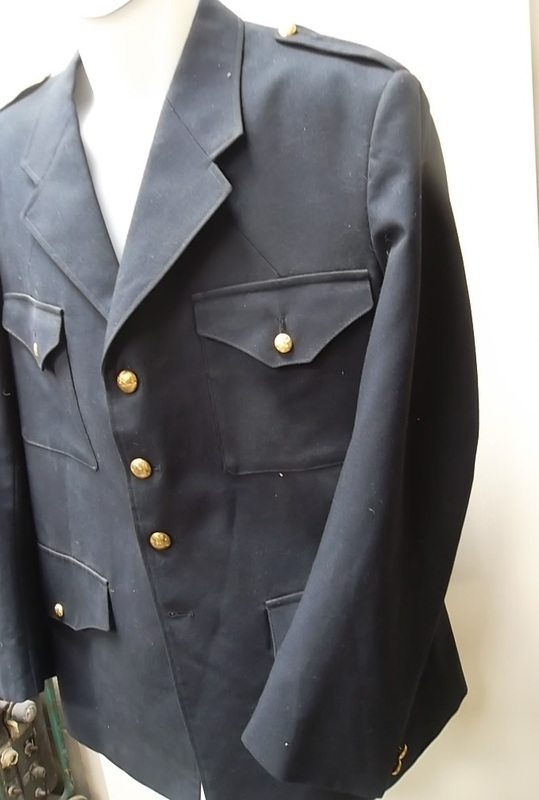 This excellent Royal Australian Artillery Summer Tunic is in as new condition. Complete with all original buttons, cloth patches and belt. Made of light weight Airtex fabric. The label which would have had the date has faded, but it has very prominent D^D on the inside left. A very rare example of a very rare item. Slouch hat not included.